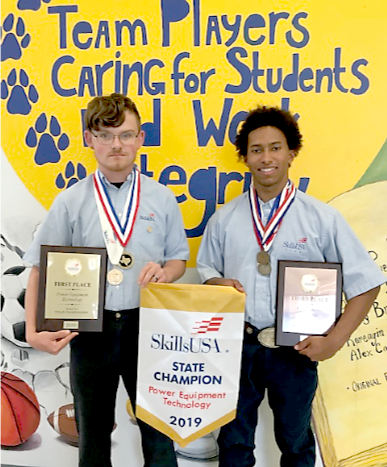 North Lamar High School sophomore Russell Meredith, left, captured the first place title in Power Equipment Technology at the State SkillsUSA Competition in Corpus Christi on April 5-7. He will go on to compete at the National SkillsUSA Competition in Louisville, Kentucky on June 23. Sophomore Cameron Clark, right, placed third in the state in Marine Technology. North Lamar’s SkillsUSA sponsor is Jared Reaves.